My aunt just got a pig and her daughter named him Hemingway, due to his extra toes, we found it a very fitting name. I wonder if his feet are to be worried about? He mostly has fully formed extra toes, so I think he should be okay? He ran away from the scary hands trying to capture him and was pretty darn fast. He is only a couple of weeks old so still has lots of growing to do. Other than being extra toes, they look fine to me. Just more nails to trim! You can have a vet give him a well-piggy checkup for peace of mind. A vet did take a look (she had never seen this in a pig before either), but in general I know more about pigs (mostly from guinealynx) than vets here do. You basically have to tell the vet what the pig has and what treatment you want. LOL at the more nails to cut, that was the second thing I thought about when I saw the feet (first being WTF?). I have always had to cut piggie nails at my aunt, I doubt she'll start now that she has even more to cut! At least his future cage mate has regular feetsies! It's a genetic thing. 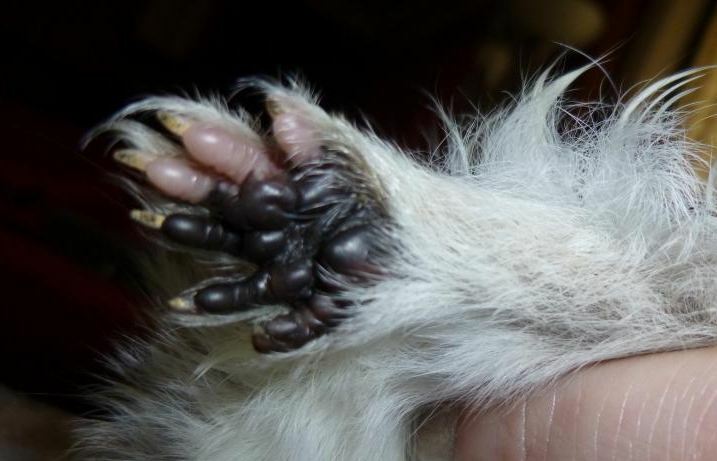 There are entire strains of guinea pigs with polydactyly. Others have it as the result of inbreeding or a genetic mutation. I am curious about why he would be all wet after an ivermectin treatment? Thanks for the detailed pics. Never seen that many toes on a pig yet. They seem OK though. Are they firm, meaning are they complete with bones and have muscles? If not, they can get caught and need to be dealt with by a vet. 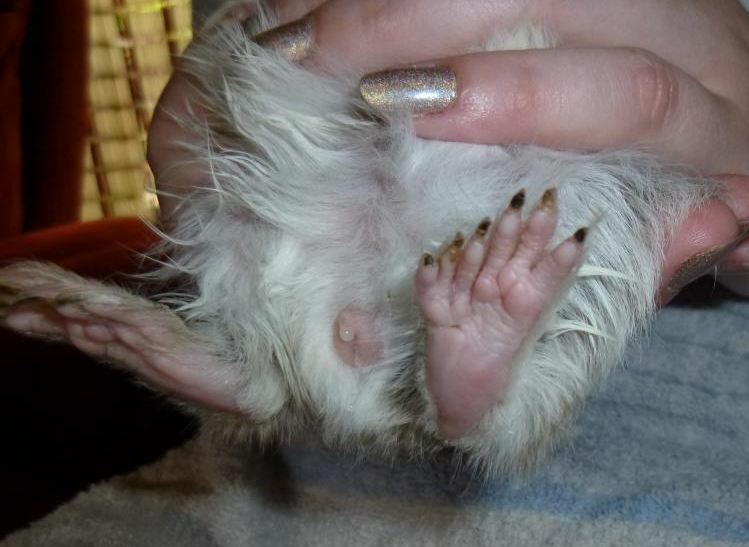 All his toes seem to be firm and fully formed so far. Not sure how this will be when he grows older, I hope it will grow just like regular feet. 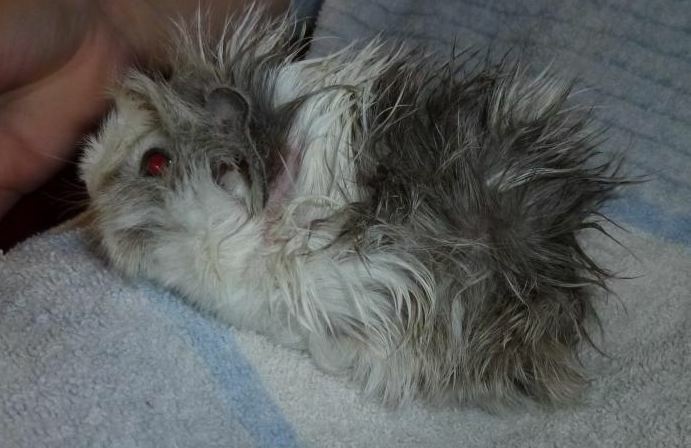 He is wet from an ivermectin treatment because they used a spray. I would have preferred a simpler topical application, but it wasn't up to me to decide. My aunt was told to come back in two weeks and they would treat him again. Told her to go back within 7-10 days. I will make sure she weighs him and figures out the proper dosage he needs and makes them give that, if they won't I will give him the proper dosage myself. I may be wrong, but I can't imagine that spray ivermectin is going to do much for him. Ivermectin works because the parasite ingests it by biting or sucking, not because it's been sprayed on. Even when it's applied topically, it's absorbed into the skin and the parasite gets it that way, rather than just because it's rubbed on the parasite. They pretty much sprayed him and it was rubbed into his skin, so I reckon he did get a dose of ivermectin. I know what I would do if it were my pig and topically dose him myself, but I can only tell my aunt, she has to decide! Your pictures are indeed great. Would you like them added to your thread permanently for future readers? This is a young guinea pig, right? 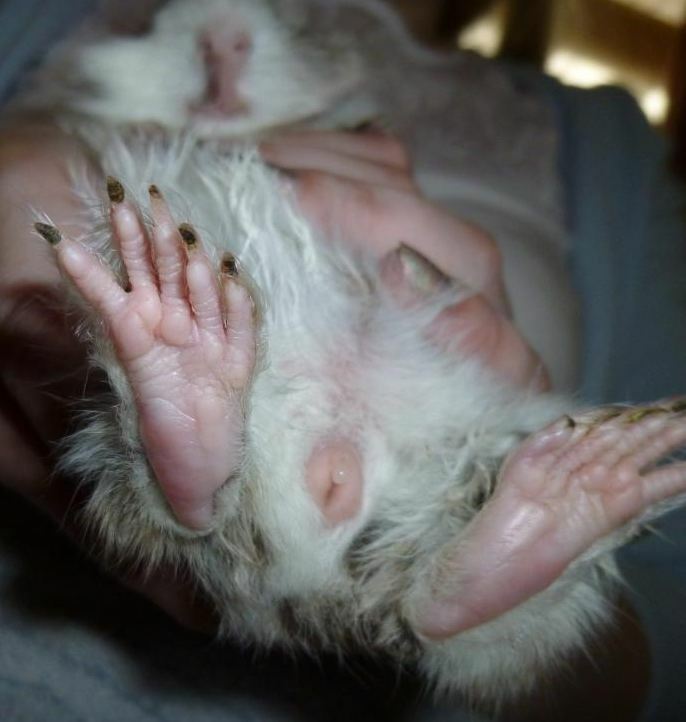 Cuy (kind of wild, grow larger than normal) can have toes like that. Keep track of weight and let us know how large your guinea pig gets. That is one cute baby. The extra toes only make him seem even cuter. He looks like a hedgehog in the first photo, is smiling in the second, and I would be smiling, too, to see most of his nails are white rather than black. You can add the pictures if you want lynx. I doubt he will be a cuy. My aunt finally weighed him last night and he was only 219grams. Technically too small for ivermectine if I remember correctly, but I checked what they put on him, and it was a really low dosage, which I figured could not do too much harm (or good), but maybe it is enough to keep him from scratching, as he does have a sore spot behind his ear. I reckon he is about four weeks old, going by his weight and size. He has peed on my cousin twice now. She was not entertained, I on the other hand, was! I will try and keep a close eye on him without being too much of a PITA to my aunt. He is not mine, therefore I do not get to tell her what to do with him, I can only give advice. I will be looking forward to seeing how big he gets! Maybe I should add a couple photos to the feet page? 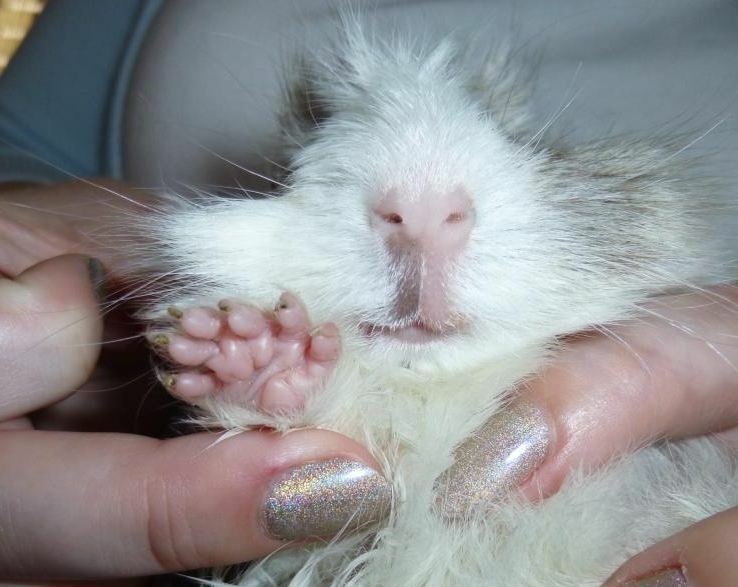 I do have some multiple toes ones - but somehow I think yours are so adorable because this is such a young guinea pig! If you want to add the pictures to the feet page that is okay with me. I will keep an eye on his feet and take pictures while he grows up. 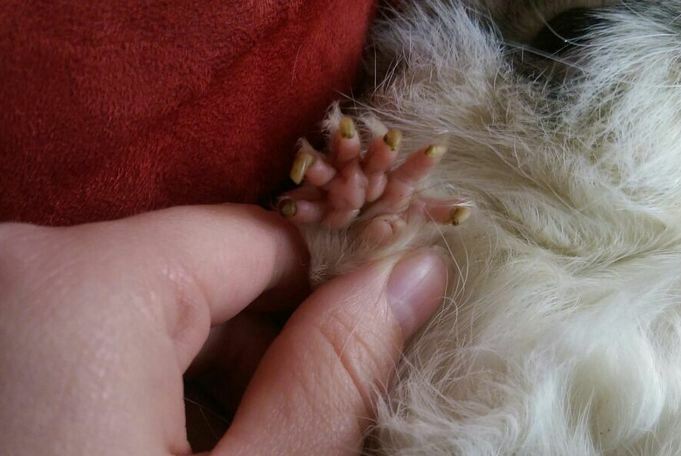 I am hoping he will be a regular sized, bouncing boar and his extra toes will not hinder him in any way. Perhaps for now, I'll add a link to this thread. He is indeed adorable. So super old topic, but thought I would update. 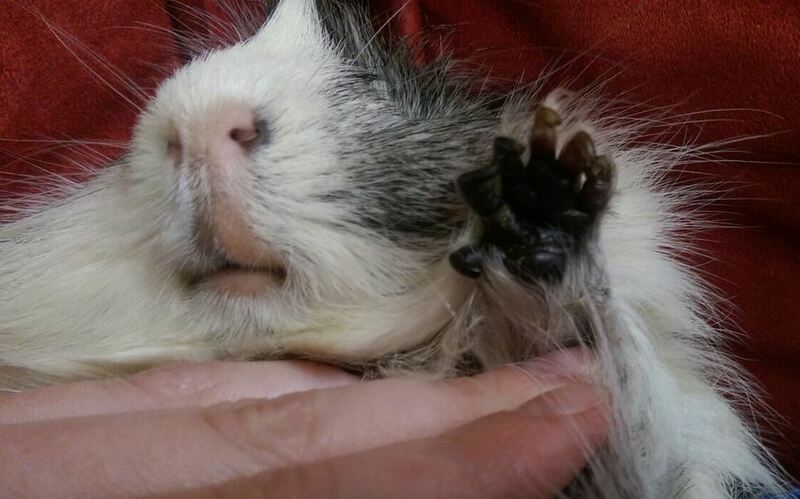 Unlike most baby piggies, Hemmie has not quite grown into his feet, but he is still gorgeous as ever. His large amount of toes doesn't seem to have any impact on him. Pictures soon to follow so we can compare his baby feetsies with his adult "paws"! He is a healthy 1316 grams.